When I find myself stuck in the mental doldrums where there is both everything and nothing to write about, I look for inspiration elsewhere. I didn’t have to look far: This morning two beautiful pieces about traveling crossed my screen almost simultaneously. This piece reminds me that no matter how far I roam, I can never escape myself. Martha explains why the hard parts of travel are also the most valuable. Then, over at Lost in Arles, my new friend Heather Robinson tells the story of how she came to live in Arles. She says it’s a story that bears repeating and I say it’s a story worth sharing. Indeed, Heather’s entire blog is a celebration of the beauty she finds in the landscape, villages, and food around her. Every one of her posts is un petit cadeau dropped into my inbox. And then, because I also needed a bit of bucking up, I reread a favorite piece by Dominique Browning. “Go where the love is,” she advises. And that’s what I’ve been doing these past couple of years as I search for new ways of working. Her post reminds me that if I keep planting the right kind of seeds, something satisfying and meaningful will eventually take root. And finally, I leave you with this video of fearless young women cruising down la Sierra de Madrid. I may have a middle-aged body, but my spirit still soars like a twenty-something’s and I can feel the wind in my face and the road vibrating under my wheels as I watch them sail down the mountain on their longboards. During my sophomore year of high school, my mother took me to a jewelry store at the local shopping center. She wanted to buy me a bracelet. 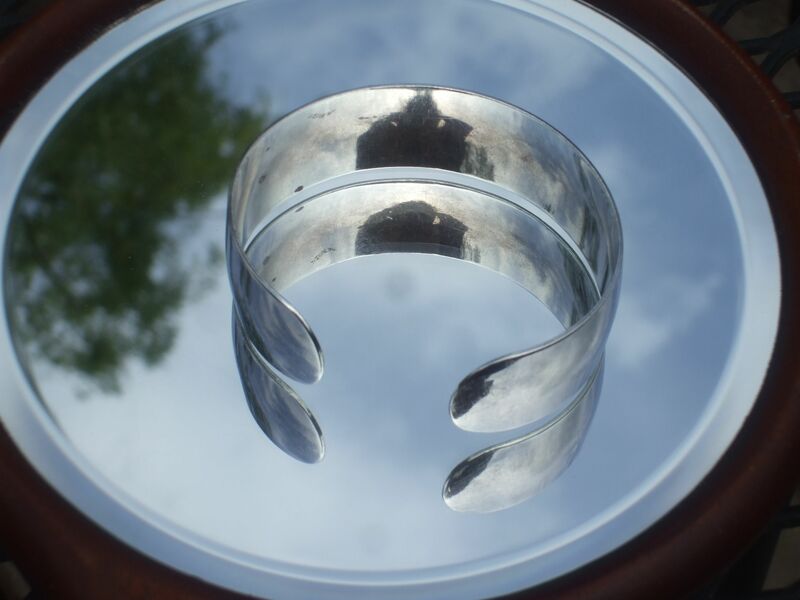 The two of us picked out a nearly one-inch-wide cuff of sterling silver. I remember the day as being sunny, and not too cold as we walked outside from store to store. Looking back, I imagine us chatting and laughing at some story about one of her friends. We were comfortable together. At the time, it seemed like an ordinary mother-daughter moment. A few months later, she was diagnosed with breast cancer, and a year after that, she was gone forever. In the wake of those facts, that we ever enjoyed such ordinary moments seems extraordinary. Now that I’m a mom myself, I’ve learned to savor the everyday time with my sons. It’s in those moments when we truly connect as people. It might happen in the car, for example, when a son finally ‘fesses up to what’s been on his mind, or plugs in his iPod to share some music that exposes his softer, romantic side. Sometimes we connect over food, or while walking around a son’s new neighborhood. A spark might flare in a complicit, but loving, exchange of looks triggered by something amusing that Dad has just said or done (usually in the kitchen). I love those exchanges. They say, “I know you,” and they almost always show me something new about myself and the people I love. My mom has been gone for my entire adult life. And while the example she set as a mother is forever imprinted on my psyche, it’s the men in my life who have taught me the real down-in-the-trenches lessons of mom-dom. My husband not only taught me how to make an infant laugh, he continues to give me the young man’s point-of-view when there’s something going on that I just don’t get. 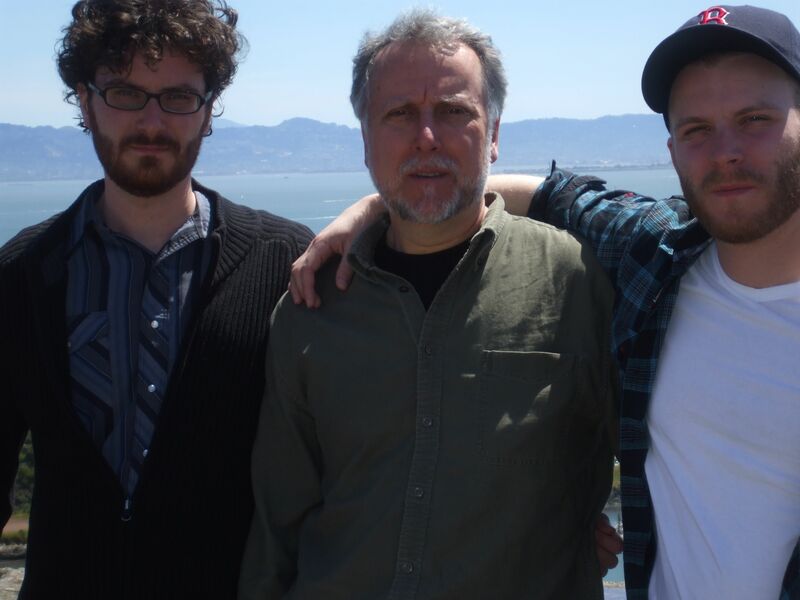 And each of my sons, in moments both painful and gratifying, have shown me something that I needed to know, or pushed me to acknowledge something that I didn’t want to see. So this Mother’s Day, as I remember my own mother, I also give a nod to the men in my life. Thanks guys, you make my life more beautiful every day. Giants, Fauna, and Flora, Oh My! Then on Thursday, when we reached the spot where I usually let Karina off her leash, she suddenly lurched forward. There was a rush of wings and a bird I’d never seen before flew up onto a nearby tree. 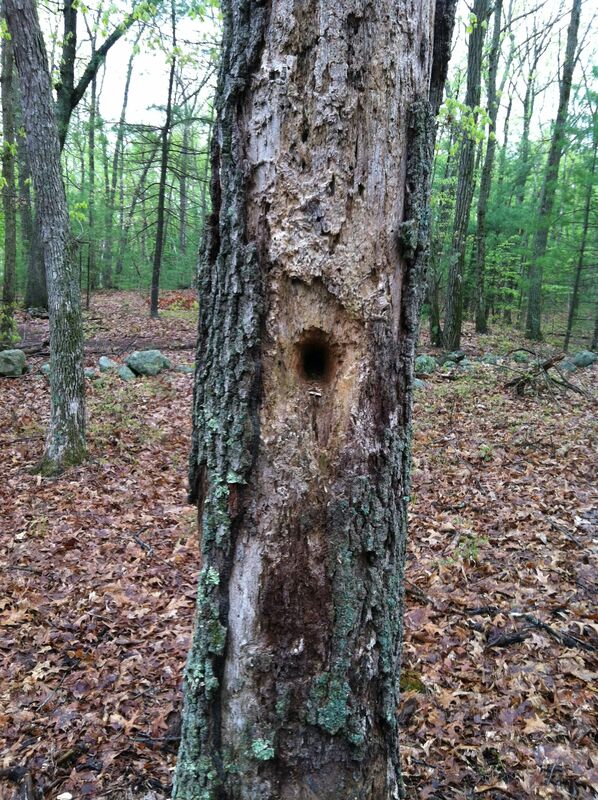 It looked a lot like my old friend Woody Woodpecker. I wondered if I was hallucinating. How could something so fabulous be here? I wasn’t quick enough with the iPhone to get a photo. In fact, I wish I hadn’t tried, because by the time I’d dug it out of my pocket, the bird had silently disappeared. 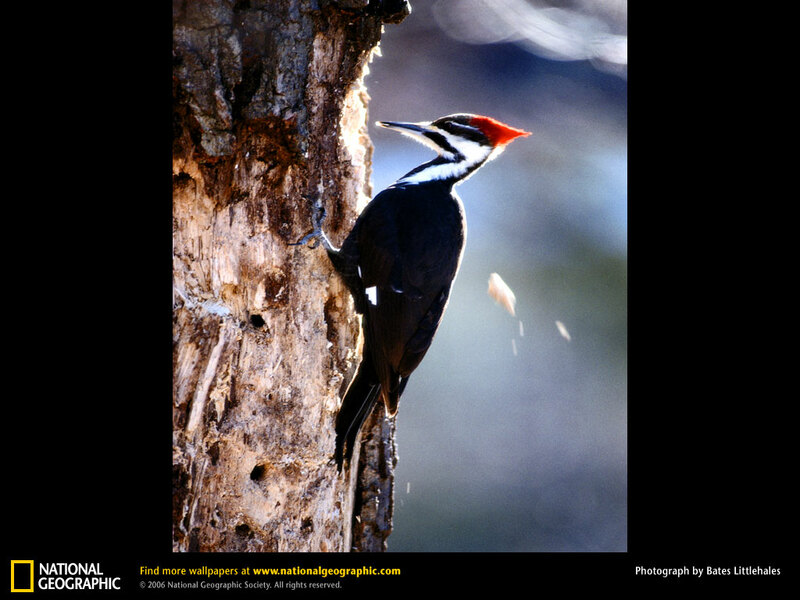 When I got home, I learned that it was a pileated woodpecker, fairly common in these parts, even though I’d never seen one before. On Friday, we went back and gathered evidence. 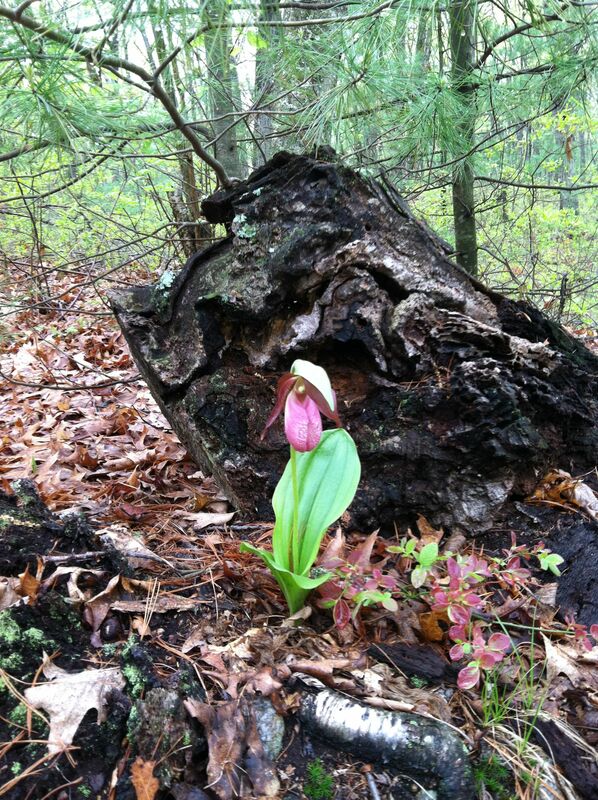 And then this morning, I was reminded that in addition to giants and woodpeckers, fabulous things are turning up in these woods all the time. 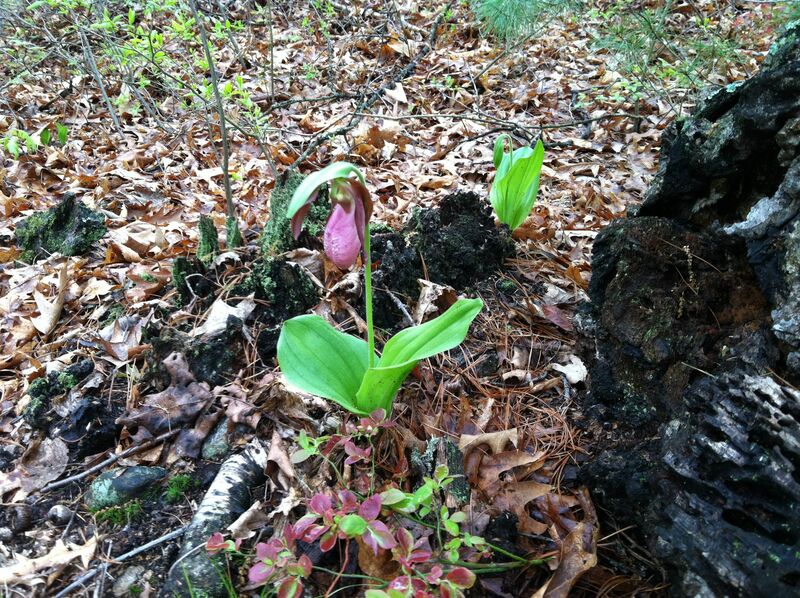 Lady slippers are one of my favorite harbingers of spring. They are something I have seen my entire life. Some years they spring up all over these woods. Theirs is a delicate beauty. 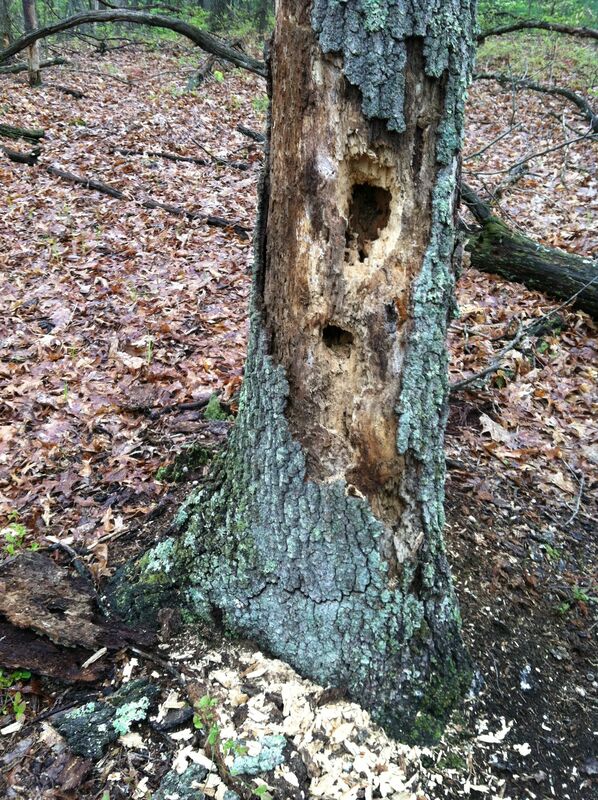 I want my grandchildren to come here and see them some day, and I want them to feel the thrill that I felt when I saw my first pileated woodpecker. That’s a big reason why I write for Moms Clean Air Force. We all need to protect our Mother Earth. In addition to this week’s woodland adventures with Karina, I also wrote a post for them about why Concord’s ban on plastic water bottles is a step forward for clean air.